Emmanuel Centre members with their families and volunteers celebrated their annual Christmas party on 4 December 2018. Photo: Jamie O’Brien. The Emmanuel Centre is a self-help centre for people with disabilities, comprising a number of organisations, groups and support networks. Last year, some 100 members of the community gathered on Tuesday 4 December from 11am at the St Francis Xavier Church where they participated in a carols session for the next hour. The Emmanuel Centre members received a gift each at their Christmas celebrations on 4 December 2018. Photo: Jamie O’Brien. Joining in the celebrations were Emeritus Archbishop Barry Hickey, St Marys Cathedral Dean Fr Sean Fernandez and various agency groups from the Archdiocese of Perth. After the carols, all those present adjourned to the outdoor area where Emmanuel Centre Coordinator Barbara Harris thanked all who have contributed their time and effort to make 2018 great. Food and drink provided by the staff were enjoyed by guests followed by a present giving ceremony to members of the Emmanuel Centre. 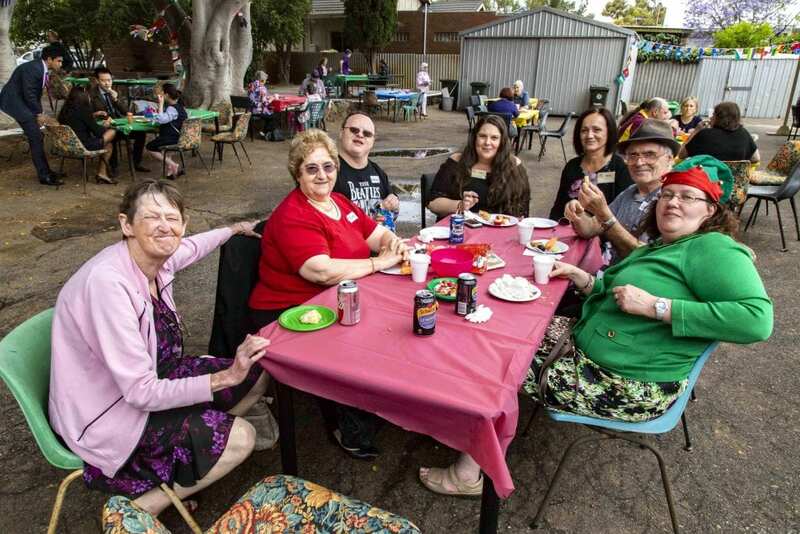 The Emmanuel centre community together with the Perth Archdiocese agencies gathered for a Christmas celebration on 4 December 2018. Photo: Jamie O’Brien. The staff and members also paid tribute to the centre’s founder, Fr Paul Pitzen who passed away on 20 October 2018. A Christmas tree decorated with the deceased photos and prayer cards for keepsake were distributed. Since its formation in 1981, the Emmanuel Centre has managed to provide a caring and supportive environment for people with disabilities, while organising various community events.